The University of Rhode Island’s S.A.V.E.S. organization will be holding a “Polar Plunge” event on Feb. 7 to raise money for both their group and for the Tomorrow Fund. Attendees will gather at the Narragansett Town Beach at noon on Saturday before plunging into the cold water together at around 12:15 p.m.. The participation fee is $5 and participants must fill out a liability waiver either on the event’s Facebook page or at the event. Though the amount is not yet set in stone, S.A.V.E.S. 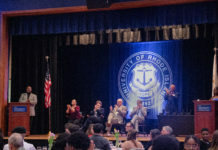 (short for Students Actively Volunteering and Engaging in Service) president Nicholas Silvestri suggested giving 75 percent of the proceeds to the Tomorrow Fund, with the remaining benefiting the URI service organization. “It’s the first fundraiser that we’ve ever done, so we want most of the funds to go toward [the Tomorrow Fund],” he said. Â The Tomorrow Fund is a nonprofit organization based out of the Hasbro Children’s Hospital that provides financial and emotional support to children with cancer and their families. S.A.V.E.S. is a student organization that serves both the university and the surrounding community in various service projects. Silvestri said the group strives to aid any project that approaches them. In the past, S.A.V.E.S. has worked with various food banks, Big Brothers Big Sisters and WaterFire Providence, among other service projects. The group also co-leads the Alternative Spring Break program with Habitat for Humanity. The idea for the polar plunge came about due to S.A.V.E.S. desire to create something simple as their premiere event. “It’s our very first event,” Silvestri said. “So we wanted to keep it as basic as possible.” Silvestri admitted it was more difficult to set up than he originally envisioned, due to the amount of coordination the organization had to do with the city of Narragansett and URI Emergency Medical Services, the latter of which will be stationed at the event. At the moment, 56 individuals have said they will attend via the event’s Facebook page, and Silvestri said representatives from the Tomorrow Fund will be bringing friends as well. The Tomorrow Fund will also be coordinating additional advertising over the radio over the next week. Additional information on the event, including the electronic waiver, can be found on the “Polar Plunge hosted by URI S.A.V.E.S.” Facebook page.